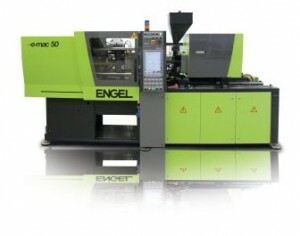 Engel Austria will be exhibiting under the motto “E-novation: Efficiency & Innovation” at Fakuma 2012, with one of the focuses being its new e-mac series injection molding machines. At its own stand, the machinery manufacturer will present five exhibits. An Expert Corners will also be available. Engel’s new e-mac range will be shown in the east foyer, with four more exhibits appear on the stands of its partners, Oni-Wärmetrafo, Lenzkes Spanntechnik, Fraunhofer Institute for Chemical Technology ICT and Hekuma. The machines in the new e-mac range are all electric and produce precise results. They are also fully modular and efficient, Engel notes. An Engel e-mac 310/100 machine with viper 6 robot, will produce wine bottle stoppers from polypropylene (PP) and liquid silicone (LSR) at the show. For the first time, it is possible to process liquid silicone together with PP via multi-component injection molding, thanks to a new low temperature process that utilizes UV vulcanization, which Engel and its mold production partner Elmet of Oftering in Austria have used to create the new multicomponent technology applications. Since silicone rubbers generally vulcanize at high temperatures, it has not been possible until now to combine them with temperature sensitive thermoplastics such as PP in a multi-component process. By contrast, new types of silicone, in collaboration with Momentive Performance Materials, vulcanize at room temperature with exposure to light in the ultraviolet wavelength range, explains Engel. To make use of this property in the field of injection molding, Elmet developed cavity inserts in the injection mold that are permeable to light. UV vulcanization also enhances the overall efficiency of the multi-component process as the new procedure requires considerably less energy than conventional LSR processing and results in shorter cycle times.